I switched to Sponge - The Bukkit Version does not Work! This is here for archive purposes ONLY! This plugin allows you to set up villagers as shops. They will sell items as admin shop (this means infinite stock). The shop will be displayed as two row inventory you can modify with chat commands as admin. Buy items from the top row and sell them at the bottom row. You may give custom names to shops and also use color codes (&). Please note that this plugin requires VAULT and a economy plugin like iConomy or Essentials. To use this commads you have to position yourself at the spawn location of the shop. /vshop create [PROFESSION] [NAME] creates a new shop at your location. name is optional. /vshop add <ITEM> <AMMOUNT> [BUYPRICE]:[SELLPRICE] [NAME] add an item of type ITEM, stack size AMMOUNT and optional display name NAME. Please don't use this method, as it's pretty limited. /vshop remove <SLOT> removes the item from the given SLOT if possible. /vshop permission <SOMETHING> sets the permission required to interact with this villager to SOMETHING. You may think of a new permission or use any existing permission. OPs will automatically bypass this. Use "none" as <SOMETHING> to make the shop public again. You don't have to set a buy- AND sell price, but at least one of them. As I mentioned (a few years ago now) I WILL update and port this plugin to Sponge! And I already started development, but the Inventory API is not ready yet. Hey guys this is the best shop plugin by far I LOVE IT but we need an update BAD!! Please Please Please bring it up to speed with 1.9 Please. I have over 60+ villagers selling almost every item. Hours and hours of config to waste. Please dont let it be for nothing. begging you for 1.9 update. Any way you can make it so that my cursor doesn't move every time an item is clicked? I would love it if I could just keep clicking on the same purchase or sell item rapidly. I love this plugin BUT Twice now after only a few day of running it, it has crashed and the shop yml file deleted costing me hours of work. How do I fix this? and is there a way of recovering the yml file? Any help from anyone would be great!!! thanks. I came to realize the issue is an incompatibility with the plugin myRPG. Just thought you should know. So this is an insanely necro post, but I cannot right click the shop at all. I cannot open his shop even after having added items. Is there something I'm missing? I have Essentials, and I have Vault. So I do /vshop create .. and it wont spawn a NPC. Anyone knows why it does that? When I restart my server the villagers lose their shops and just become normal villagers. If u use a hacked cliend and toggeld "FastPlace" and than u Open the GUI You can Steal ALL THE ITEMS without Pay ANITHING! PLS FIX IT! Hey, really like the plugin but would you be able to make it open source so myself and other server owners can tweak it for customization? 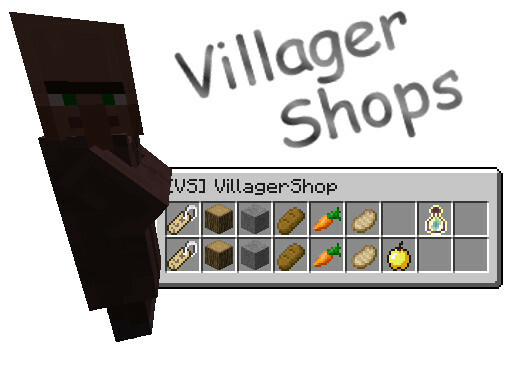 If not, all I am really after is to be able to change the name of the shop from [VS] (Villager name) to whatever, and also modify the prices to have a symbol at the end. IMPORTAN BUG> You can get items FREE by double right click. Push double right click very fast and the shop get bug and you can get all FREE. Is a very importan bug.,..in my server all was get potion and goldenaples FREE. love love love love love love love love love love love love love love love love love love love love?